Should I Use Twitter in My SEO Strategy? Believe it or not, Twitter has great SEO potential. And you should be taking full advantage of it. Unfortunately, many refuse to participate and view this social media network as a waste of time or simply too complicated. This is not the case and you really are missing out on a fantastic opportunity to boost your SEO efforts. Similarly, many don’t use Twitter the way it should be used and therefore never get to experience its real benefits. But for all you haters and non-participators I have one message: Think Again! Listed below are a few quick steps to help get you started, six reasons why you should be using Twitter in your SEO process and a handful of helpful tools to facilitate the process. 1. Choose Your Name. This does not have to be your real name. It should, however, be relevant to you and a keyword people are likely to use when searching for you as it will appear in the title tag of your profile as well as Google’s link to your profile. 2. Choose a Username. Ideally, this should be an exact match or at least similar to your business or individual name. Avoid symbols and numbers as this can come across as unprofessional and can also be viewed as spam by Google. 3. Include a Bio and Link. This is limited to 160 characters. State what you do and highlight the benefits your company, products or services offer. Try to include at least 1-2 industry related keywords as this leads to higher CTR (Click through Rate). 4. Upload a Profile Picture. If you’re a business this should be your logo. If you’re an individual this should be a professional and clean headshot. 5. Choose a Background. Try to select a background that is an extension of your website and overall branding. You might want to ask your web designer for help here. 1. Google’s Confirmation… Enough Said! “Yes, we do use [tweeted links and RTs] as a signal. It is used as a signal in our organic and news rankings. We also use it to enhance our news universal by marking how many people shared an article.”- Google Representative, December 2010. If you were ever in doubt as to whether or not social signals play a role in the SERPs (Search Engine Results Pages) organic rankings… doubt no more. Google and Bing both confirmed in an interview with Danny Sullivan from Search Engine Land that their algorithms do indeed assign value to the relative authority of Tweeters and the links they tweet and retweet daily. Therefore actively sharing links is a sound way to build natural backlinks to your website. But you need to make sure that you make sharing and retweeting easy for others. Include easy sharing buttons for all articles and blog posts you publish. Also make sure your tweets are the standard 140 character length with 10-20 character legroom retweets. You can use websites like Tiny URL or Bitly to shorten the link if you need more characters for your tweets. However, it’s always better to use a service like YOURLS to take advantage of your own URL shortener service. Google has also made it clear that if you’re perceived as an authority within your niche then they’re likely to give your tweeted links more weight in the SERPs. That’s when Twitter comes into play. Yes, Twitter is a platform to expand reach and increase brand awareness but it’s also a medium where people actively listen and engage. As you begin to use Twitter you will notice that it’s all about conversation. It’s about interacting with your prospects and consumers. Over time they will begin to view you as the go-to source within your niche. Warning: If you are not going to do this then do not use Twitter in your SEO campaign. It simply won’t work. Network, be sociable and reply. Show your followers that you want to engage and be involved. This provides optimal customer service and shows that you are personable. The key takeaway here is to be genuinely helpful. Actively participate in industry related discussions and assist people with their concerns and queries. Twitter offers a convenient way to connect with your industry-specific celebrities. Following your thought leaders and building relationships with them can yield great results for your SEO campaign. You never know, once you’ve exchanged a few tweets and engaged with them over a period of time, you may be able to approach them for a retweet of one of your articles. It should be a reciprocal relationship where you’ve done something for them so they’re more inclined to do something for you. Tip: Mention them in your article or blog post. You can then tag them in the tweet and let them know they’re mentioned in your latest publication. They may very well appreciate the mention and retweet the link. And remember that a retweet from an already well established authority is very powerful in Google’s eyes. Following authorities within your industry is also a smart way to see what they’re talking about and keep an eye on your competition. It might even give you some brilliant content ideas of your own. You can also use Twitter for public relations outreach. Say, for instance, you use public relations outreach tools such as HARO or Vocus and you want to connect with a reporter for a news story involving your company or an editor of a blog for guest blogging opportunities. Guest blogging is an excellent way to obtain a quality link back to your site which is great for SEO. Twitter offers an ideal means to easily track down these individuals and build a relationship with them before asking them for a favor. Rand Fishkin, CEO of SEOmoz released a Whiteboard Friday video illustrating the importance of Twitter as a keyword research tool. He and his company are clearly a major SEO authority … so you can trust what Rand says here. As social signals are now intertwined with the SERPS they can help you predict keywords, spot trends and maintain a competitive edge. Google’s Panda-Penguin algorithm updates have cracked down on overly optimized, generic and thin content as well as “easy” linkbuilding tactics. Twitter is an excellent source for new content ideas. If you’re a local business you can search for questions being asked by Tweeters in your local area and address them in the form of an informative article or blog post. Twitter also gives you easy access to trending topics worldwide, nationwide and even in your city. If you’re able to jump on these topics while they’re still hot it can do wonders for your SEO efforts. Find ways to relate what’s trending to your own industry. You should also try entering the 5W’s into the Twitter search query box. Also remember to check your retweeted tweets and favorite tweets. Retweeted tweets may be an indication of what your readers are interested in and want to read and learn more about and your own favorite tweets by other Tweeters may give you an idea of your own. I’ve left this reason till last for a reason… While you can use Twitter to post news or updates about your company or products, please don’t do this before you become familiar with the format and etiquette of Twitter. The best way to do this is to post a link to the full content of the news or update and hashtag relevant keywords so that your customers and prospects can easily find it. Think of what’s valuable to your consumers and let them hear about it first on Twitter. You’ll be amazed how your following will grow. It’s also not uncommon for companies to post promotions, sales and specials on Twitter. A great example would be Dell. It’s important to remember, however, that Twitter is about conversation and breaking news. Be sure that if you are posting promotional information that you make it conversational and personal. If users want an ad, they’ll turn on a TV. Listorious allows you to search for Twitter accounts and lets you search other peoples’ lists. This helps you find targeted individuals faster. It also lets you connect with individuals easier with a feature that allows you to ask them questions about certain topics. Great for guest blogging! Commun.it keeps track of your Twitter network. It has the functionality to display the people you have the most influence on and those you are influenced by. There’s also a feature that gives you an update on mentions of you outside your network. TweetBeep for tracking. Tracking Twitter is just as important as using it. Not only do you want to increase the amount of followers on your account, but you also want to test your impact on them. You can easily track mentions by using this cost effective method that sends you an e-mail every time someone mentions your name. On its sixth birthday earlier this year Twitter announced over 340 million tweets are posted every day. Are you mentioned in any of them? This might be a good time to find out. 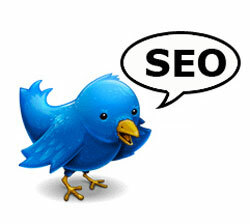 A business really has a better chance of successful SEO if they include Twitter in the mix. Twitter is part of a new trend and the way businesses evolve and thrive is by adapting to new trends and technologies. Don’t have the time or patience for it? Let the social media experts at Optimum7 craft your social media strategy and watch your SEO results soar. Contact Us today for an initial no obligation consultation.